Vacuum effect heals painful, herniated discs. When Ken Hoydic, 64, was in his 40s, he suffered a herniated disc in his back, the result of years of heavy lifting at his job in a hospital warehouse. With care, the Connecticut native got his back pain under control, then returned to living as usual with the condition. In 2017, however, Ken experienced new, excruciating pain in his back that he couldn’t live with. “After that herniated disc, I was fine, and I could do everything,” confirms Ken. “I hiked. I golfed. I umpired baseball and softball games and refereed high school sports. I never worried about my back. One month later, Ken’s worst nightmare came true. As he volunteered at a local animal reserve, his back suddenly stiffened and locked up. Then, the pain hit him – hard. “I almost couldn’t get into my car to go home,” he says. “It was a constant, sharp pain, a ten out of ten. I couldn’t do anything. I couldn’t golf or do any of my activities. I couldn’t exercise. For the first five days, I couldn’t walk without crutches. I couldn’t even lie down in bed without pain. I slept sitting up on the couch. I was miserable. Unfortunately, the chiropractor couldn’t help Ken, so he tried physical therapy. He wasn’t happy with that physical therapist’s approach, so he began seeing another physical therapist, who performed a stretching procedure on Ken that helped him a little. That got Ken thinking that stretching his back might lead to greater pain relief, so he started looking for centers that offered therapies that decompress the spine. That’s how he found Back Pain Institute of West Florida, where Dr. Aderholdt offers a unique, nonsurgical treatment calledVAX-D® Therapy. 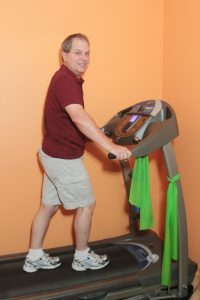 “Ken had a very painful back condition, and for him, as with many patients with similar painful conditions, I recommended VAX-D therapy,” notes Dr. Aderholdt, who is one of the few doctors in the country who offers this patented, FDA-approved medical decompression technique for alleviating pressure on the discs of the spine. Dr. Aderholdt stresses that while VAX-D therapy is a medical decompression technique, it is not a traction device. It works differently and achieves significantly better results. During VAX-D treatment, the patient relaxes on a comfortable, computer-controlled table, secured with a pelvic belt or patented cervical collar, depending on the area to be treated. Carefully specified tension and pressure changes guide the use of VAX-D, allowing the therapist to focus decompression at the exact level of spinal dysfunction. The VAX-D system is computerized, so it enables the table to make subtle but targeted movements, which create a powerful vacuum within the disc space. This vacuum gently draws the disc back to its proper orientation, which pulls nutrient-rich spinal fluid into the disc and stimulates repair cells that effectively mend the disc. VAX-D treatment has, over the years, developed a long track record of many satisfied patients, observes Dr. Aderholdt. Long-term studies have shown that VAX-D is effective in more than 88 percent of patients who go through the treatment. Dr. Aderholdt determines the number of VAX-D treatments for each patient based on their unique condition. People must complete their entire course of therapy to receive the full benefit of the treatment, but some people, including Ken, begin to feel pain relief earlier in the process. With his therapy completed and his pain relieved, Ken’s life is getting back to normal. He can now bend to get into his car, sleep in his bed and walk without assistance. Ken reports that while he feels much better, he hasn’t returned to the golf course yet. He says Dr. Aderholdt advised him to not overdo his activities until the discs have had more time to heal. Ken has returned to some other sports activities, however, and hopes to do more soon. Ken is pleased with the results he achieved with his VAX-D therapy. He credits Dr. Aderholdt and his unique, nonsurgical treatment for his excellent outcome.